We have been alerted by Find A Job that they are making some improvements to how their vacancies work. Currently job adverts that have been posted to the live service will remain live for a default period of 30 days. As of 9th April 2019, you will have the option of continuing to use the default period of 30 days or you will be able to specify a closing date that is less than the 30-day default period. For this, if your vacancy has an end date longer than 30 days then the service will only list your job for their specified maximum term of 30 days. If you specify a closing date within the 30-day period, then your actual closing date will be included within the Vacancy submission and it will close on that date. Updates will also be handled in the same way. if the closing date is within the 30-day period then the vacancy would update to this date. We will be rolling out updates to the current SOC field within the Find a Job posting section to update the list to these new values. N.B. All historical vacancies with SOC data will require updating in order to post to the Find a Job channel. This is also now an optional field. Vacancies without this detail in a submission are automatically categorised via a keyword search on the vacancy description, by the Find a Job system. It is advisable that you categorise your vacancies in order to be listed correctly within the Find a Job system. We will be rolling out these changes to your Microsoft system week commencing 15th April so please advise all users of these imminent changes. JustApply is delivered with its own integrated solution in Microsoft Dynamics (CRM). This can be for any version from 2011 upwards, on premise or online. If your organisation is already using Dynamics CRM the solution can be added directly into your existing system and if you already work with a partner for your Dynamics CRM we will be happy to collaborate with them. In the event that your organisation uses a different CRM solution or would like integration to any other software we can also integrate directly with many other systems and/or provide an API. 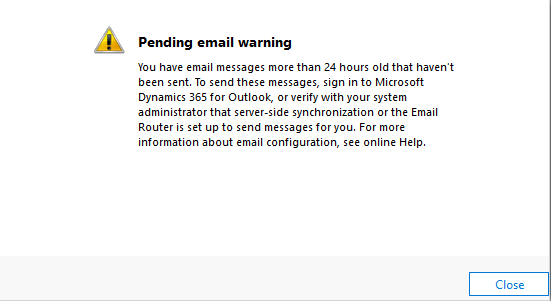 Do you often log into Dynamics 365 and then get greeted with this warning message? It drives you mad doesn’t it and you get to a point where you have had enough of clicking the close button each time you log in so you decide to do something about it. Well you’re in luck as we have the answers! Which is why you’re probably reading this blog post in the first place! The popup warning message is there for a good reason, it’s to let you know that there are unsent emails sat in your system so it would be a good idea to find out what they are. Emails may not send for a variety of different reasons so its best to check out what they are, how they were being sent and what can you do about it so that you minimise the problem going forward. First, lets take a look at those rouge records that are giving us this warning. 1) Use the Advanced Find screen, Clicking on the Filter Icon at the top of the screen in the main ribbon (Right hand aligned) will get you there. 3) Now to set the Criteria of the Advanced Find. We need to find records that have a Status Reason of ‘Pending Send’. 4) Now when clicking onto results (in the ribbon) you will see all of the emails that are causing your ‘Pending Email Warning’. From here you can access each record individually or you may notice a pattern with the results and find that it maybe an automated workflow that is causing this issue. Whatever it maybe, either resolving these one by one or deleting them from your system will clear your ‘Pending Email Warning’ from appearing when you first log in. Want to grow your apprenticeships? Do you want to grow your Apprenticeships? Organisations that aspire to be truly responsive to the needs of employers face a challenge in handling increasing numbers of Apprenticeship Vacancies and Candidates whilst controlling costs. Qualifying and processing large numbers of Candidates is time consuming and resource hungry at a time when immense pressure is being placed on budgets across the Further Education & Skills Sector. Organisations offering Apprenticeships and Traineeships need to do more with less. This is where JustApply comes in. JustApply offers FE Colleges, Universities and Private Training Providers their own customised and Branded Professional Recruitment Solution and Portal. Your organisation can offer Employers the opportunity to create their own Vacancies online and Candidates can register their own details, upload or create their own CV, sector interests and apply for Vacancies with a single click. JustApply can post vacancies to National Apprenticeship Service (NAS), Find a Job, Facebook, Twitter, Not Going to Uni, Careermap, Indeed and many other Recruitment Portals (see our Integrations page) in addition to your own website so the potential pool of candidates is much larger. This frees up your teams to provide an improved service to employers and have all data stored in one easily accessible place. Let us show you JustApply and discuss what it could do for your organisation. Copyright © 2018 JustApply and the JustApply logo are registered trademarks of JustApply Ltd‏. All . Simple theme. Powered by Blogger.